Notes: Dixon #9. Bar Rep. 19. Butler Calveslake Tor - Vol. 3. Map 50.4 (diagram p.154). Grinsell SHAUGH PRIOR 3. 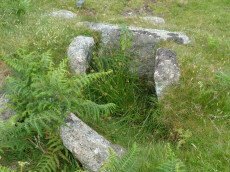 "A perfect, well constructed cist at Calveslake. Length, 3ft 7inches; width at north end,1ft 7 1/2 inches; at south end, 1ft 9inches, depth to floor, 2ft 7inches. 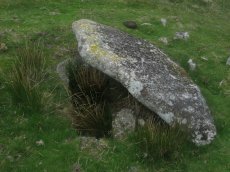 An irregular shaped cover-stone overhangs the eastern end of the cist. 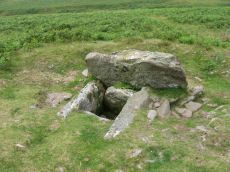 The barrow in which the cist stands has a diameter of 18 feet." Lethbridge Calves Lake cist p.42-43, diagram p.42. Notes: Turner B1. "Turner identifies this site as an embanked stone circle; an annular bank of earth and/or stones with an inner edge of orthostats. Internal diam 16m with bank 0.8m wide and 0.3m high. The bank has been pushed out on the sse side and the stones lean outward (turner)." Notes: nb. Not listed by Turner - assigned as "Ring Setting" type cairn due to description in NMR. Butler Vol. 3. Map 49.6. 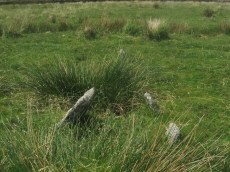 Remains of a ring cairn with three hollows visible within the circle of stones. 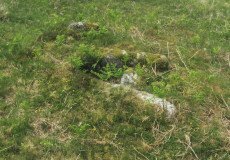 Two of these probably represent the sites of the two cists recorded by Breton who referred to this cairn as the 'Ditsworthy Circle'. Nothing can be seen of the cists today. Notes: Turner E35. "stone circle" marked on os 6" 1906. This site was almost totally excavated in 1914. Half an 11 foot diameter kerb circle and the slight remains of a cairn were found.3 flint flakes and a "well finished" scraper were found. The 34th Barrow Report includes a photo of the flints and the excavated and exposed kerb. Notes: "The drizzlecombe pound (diam (max 67m, min 64m), thic of wall (max 1.52m, min 1.37m), area 0.3ha) is not circular as there is a considerable length of straight wall on the sw. The wall is much ruined in parts. An inner lining of slabs is still visible on the nw side. Mean elevation of ground is 366m od ground slopes to sw with mean gradient of 1 in 7. 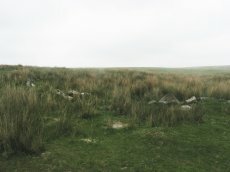 A cairn lies a few yards outside the pound wall, two hut circles within the enclosure. The entrance is in the west wall". Lethbridge pp.38-42, diagram p.38. Notes: Lethbridge pp.38-42. Diagram p.38. Ceremonial complex consisting of three stone rows headed by massive standing stones and also associated cairns and cists. Notes: Central in alignment of 3 cairns. Cairn heads the NW Drizzlecombe row. See diagram in coverage on Prehistoric Dartmoor Walks, marked as C3. Notes: Turner F24. Western most in alignment of 3 cairns. The other two cairns head Drizzlecombe rows. See diagram in coverage on Prehistoric Dartmoor Walks, marked as C4. 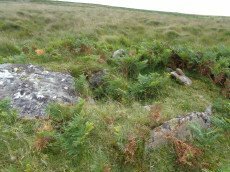 Notes: Largest standing stone on Dartmoor - terminal for Drizzlecombe stone row. It is 4.2m in height with a distinctive bulging profile at the top. 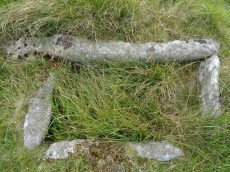 Worth suggests it was probably dragged here from Higher Hartor Tor about 1km away. Re-erected in 1893. Lethbridge Row B. pp.38-42. Diagram p.38. Notes: Terminal for Drizzlecombe NW stone row. Re-erected in 1893. Lethbridge Row C. pp.38-42. Diagram p.38. 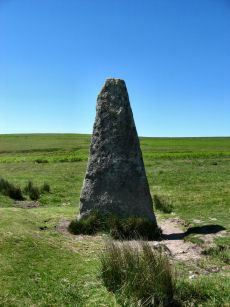 Notes: "Cairn lies at the north-east end of Row A (South Row)of the Drizzlecombe group. Cairn measures 6.7 metres in diameter, up to 0.8 metres high, with central hollow 2.3 metres by 1.5 metres by 0.25 metres deep." "Small number of edge stones around the periphery represent a kerb. 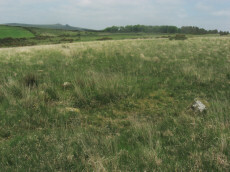 Large flat stone, 1.7m by 1m by 0.3m thick, situated immediately s of the mound may be the displaced coverstone from a cist"
Notes: Terminal stone of the southern double row at Drizzlecombe. 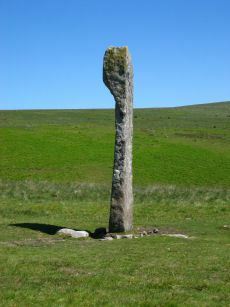 The standing stone at the southwest end measures 1.8 metres by 0.4 metres and is 3.2 metres high. Re-erected in 1893. Lethbridge Row A pp.38-42. Diagram p.38. 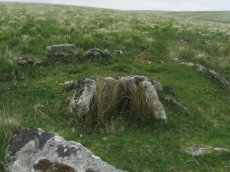 Notes: The Giant's Basin is an impressive but heavily disturbed cairn lying adjacent to the Drizzlecombe Stone Rows. It measures approximately 22 metres in diameter, a maximum of 3 metres high and is partially turf-covered. An approximately 2.5 metre wide reed-covered slight depression around its circumference suggests a silted ditch. 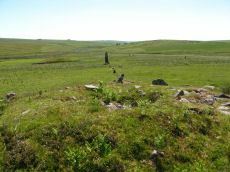 Much of the central part of the cairn has been removed to a depth of 1.65m and most of excavated material in the form of fist-sized stones and small boulders has been deposited around the rim of the mound. Lethbridge pp.38-42, diagram p.38. Notes: "The structure comprises a flat slab measuring 1.2m by 0.76m which rests at a slight angle on three upright slabs. 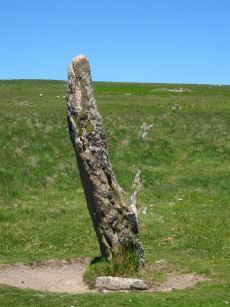 These slabs, up to 0.4m high, form a 'z' shape on plan in what appears to be a slight hollow. This feature has been classified by some authorities as a cist although others reject this interpretation for either positional or structural reasons. The historical and archaeological tradition for the existence of a cist here is by no means certain. Known cists in the locality have invariably had their coverstones removed and are open. It is a scheduled ancient monument." 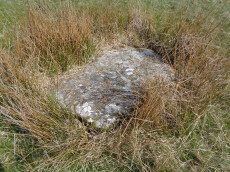 Notes: "A little further to the east on giant's hill another cist was photographed in 2004. A large flat stone c0.9m x c0.9m partly covered by vegetation is the capstone of a small square cist c0.56m x 0.56m. One of the side stones is missing. (lethbridge)." Lethbridge p.48 Giant's Hill unscheduled Cist diagram p.47. Notes: "The cist is situated at the wsw end of the cairn, is 1.4m by 0.7m by 0.3m deep and is orientated ne-sw". Lethbridge p.48 Giant's Hill scheduled Cist diagram p.47. Notes: (Previously listed as Gutter Tor No. 1) Dixon #2. Bar Rep. 19. Butler Gutter Tor 2 - Vol. 3. Map 49.5 (diagram p.118 "Summit cist"). Grinsell SHEEPSTOR 15. Excavated by Worth in 1900. "situated on the flat top of Gutter Tor at about 345m OD just on the north side of the crest of the hill. 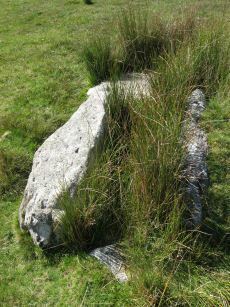 Two end stones and a side stone remain upright". Lethbridge p.32 Cist A. Notes: Butler Hen Tor 1 (Cairn 1) - Vol. 3. Map 49.22 (general plan of Hen Tor with diagram of cists pp.146-7). "A low earthen barrow or cairn with cist. The barrow is 4m by 3.5m and 0.6m high. The centrally placed cist is 1.2m by 0.75m. internally and 0.2m deep. 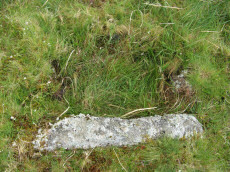 Three side stones visible, with the cist aligned north-east/south-west, but no coverstone. The overall condition is fair". Lethbridge p.50-51 Shavercombe Cist F - diagram p.49. Notes: Turner E48 - Shavercombe . Dixon Hentor. Dixon #11. Bar Rep. 20. 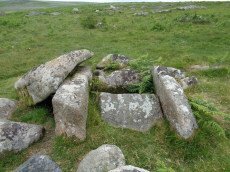 Butler Hen Tor Cairn 2 - Vol. 3. Map 49.22 (general plan of Hen Tor with diagram of cists pp.146-7). Grinsell SHAUGH PRIOR 26. "A cairn with circle and cist. 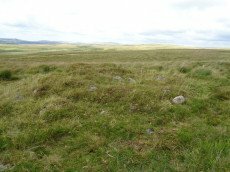 The cairn is 5m in diameter and 0.4m high and contains at least six upright stones forming a circle that surrounds the centrally placed cist. 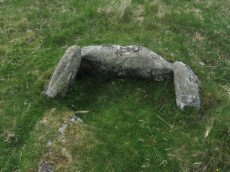 The cist, in fair condition, is aligned north west/south east. 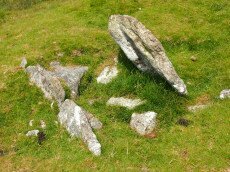 A flat stone lying immediately south west of the cist may be the capstone." Lethbridge p.50-51 Shavercombe Cist E - diagram p.49. Notes: Butler Hen Tor 7 (Cairn 7)- Vol. 3. Map 49.22 (general plan of Hen Tor with diagram of cists pp.146-7). Grinsell SHAUGH PRIOR 20 (N of Shavercombe Brook). "The oval cairn is 7.5m by 6.5m and 0.9m high with some kerbing. 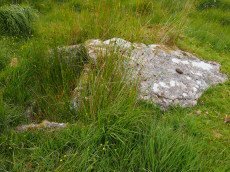 An amorphous hollow occupies the centre of the mound and a single sidestone of the cist remains in situ". Notes: Dixon #50. Bar Rep. 52. Butler Hen Tor 5 (Cairn 5) - Vol. 3. Map 49.22 (general plan of Hen Tor with diagram of cists pp.146-7). Grinsell SHAUGH PRIOR 30. 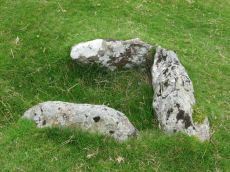 A cist consisting of two sidestones, one of which has fallen outwards, and an irregular shaped coverstone. Lethbridge p.50 Shavercombe Cist D - diagram p.49. 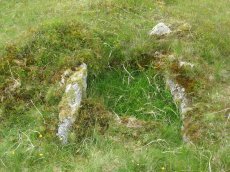 The author of this website was unable to locate this cist in the vicinity of SX 59708 65692 on 13/08/17. The site is clearly difficult to find. The area is dense in bracken and according to Lethbridge the cist is very badly damaged. It is unclear how accurate the grid reference is -although it is quite possible that the problem is simply that it is overgrown and difficult to see. Notes: Dixon #51. Bar Rep. 52. 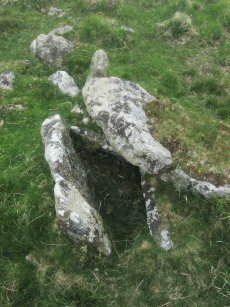 Butler Hen Tor 3 (Cairn 3) - Vol. 3. Map 49.22 (general plan of Hen Tor with diagram of cists pp.146-7). Grinsell SHAUGH PRIOR 28. "The cairn measures 4.7m in diameter and 0.5m high. 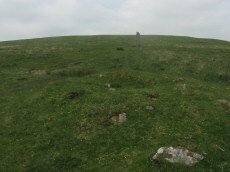 The cist, aligned north west to south east, measures 0.8m by 0.4m and is 0.3m deep. A probable coverstone 2.0m to the north measures 0.9m by 0.7m". Lethbridge p.49 Shavercombe Cist B - diagram p.49. Notes: Turner E45 - has "central cist". Not listed by Butler (relevant map Vol. 3. Map 49.22). Grinsell SHAUGH PRIOR 48. "A slight cairn with retaining circle, enclosing a cist aligned SSE-NNW, near the junction of Shavercombe Lake and River Plym." Notes: Possible cist reported by Sam Goodwin. This site is close to the ruins of Hentor Warren House. The structure has the appearance of being a Bronze Age site but it is situated in close proximity to a jumble of remains from the historic period including buildings and walls. Site visited by the author and Sam on 16/06/2018. Notes: Possible cist reported by Sam Goodwin. This site is close to the ruins of Hentor Warren House. The structure has the appearance of being a Bronze Age site but it is situated in close proximity to a jumble of remains from the historic period including buildings and walls. Site visited by the author and Sam on 16/06/2018. This particular slab has a cavity below it which is large enough for a dog to shelter in. On top of the slab is a thick layer which could represent remains of a cairn. UPDATE 16/01/2019. 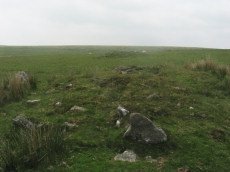 This site is described as a "cooler" in Eric Hemery's High Dartmoor on p.21 photo 19. "A cupboard recess or chamber used for cool-storage of foodstuffs" (p.33). See also p.39 photo 39 and p.200 for "Mother Nicholl's Book -place" - another cupboard recess within the walls of Hentor Warren House. Notes: Turner E47 - Hentor Warren. Dixon Shavercombe Cist. Dixon #12. Bar Rep. 20. 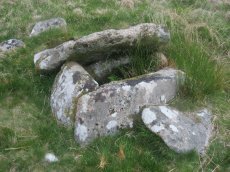 Butler Hen Tor Cairn 4- Vol. 3. Map 49.22 (general plan of Hen Tor with diagram of cists pp.146-7). Grinsell SHAUGH PRIOR 29. 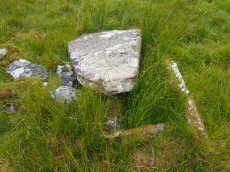 "On the slope north of Hen Tor at 395.0m OD is the remains of a cairn with a cist. The cairn measures 5.6m in diameter and 0.6m in height with a few stones of a cairn circle 3.2m in diameter remaining on the west side. The cist is 1.2m by 0.4m and 0.5m deep with a coverstone 1.6m by 1.1m at its maximum." Lethbridge p.50 Shavercombe Cist C - diagram p.49. Notes: Butler Langcombe Brook 5 (Cairn 5) - Vol. 3. Map 50.3 (pp.148-54 general plan of Langcombe Brook cairns p.151, diagram of Langcombe cists p.153). Grinsell SHAUGH PRIOR 17. "Two end stones and two side stones are in position but the coverstone is missing. Notes: Dixon #3. Bar Rep. 19. 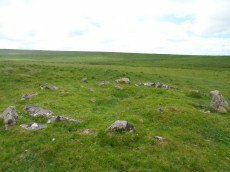 Butler Willings Walls 3 (Cairn & Cist 3) - Vol. 3. Map 51.6 (diagram p.166). Grinsell SHAUGH PRIOR 24. 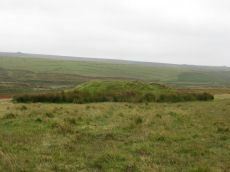 "A cairn immediately adjacent to and west of Willings Walls Reave. The cairn mound measures 9 metres in diameter and up to 0.5 metres high. 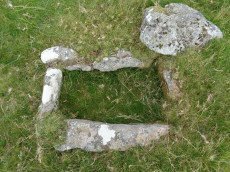 It contains a central cist with one end slab and two side slabs in place". Lethbridge p.52-3 Willingswalls Cist 1 (W of Reave) - diagram p52. Notes: Dixon #45. Bar Rep. 48. Butler Eylesbarrow S.W - Vol. 3. Map 47.11 (diagram p.70). Grinsell SHEEPSTOR 7. Notes: Dixon #54. Bar Rep. 52. Butler Vol. 3. Map 47.10 (diagram p.70). Grinsell SHEEPSTOR 2. "Located in an isolated pocket of closely cropped grass and surounded by tinners pits. 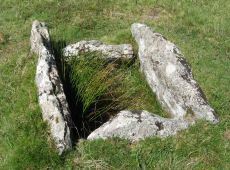 Only three slabs survive in place surrounding a hollow and forming the sides of the cist. The fourth side is missing as is the capstone and any trace of a mound." Lethbridge Outcombe (note different spelling) Cist p.30. Notes: "Shavercombe pound is not circular. There is no hut circle within the pound. It is one of two main enclosures in a scheduled area which also includes three isolated hut circles. The fence or wall consisted of granite with large stones in the bottom courses. There are many long stones like broad gateposts laid lengthwise along both faces of the wall and filled between in the centre with small stones. The upper part was probably similarly faced with smaller blocks." PMD: Willings Walls Warren S.
Notes: Turner E36. Dixon #48. Bar Rep. 51. Butler Willings Walls 2 - Vol. 3. Map 51.6 (diagram p.165). Grinsell SHAUGH PRIOR 25. 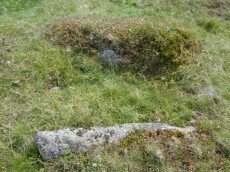 "Remains of a kerbed cairn with cist On a slight NW slope near a reave. 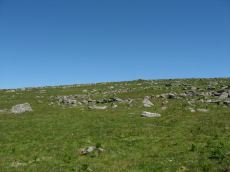 The cairn is 4.6m in diameter and 0.6m high. 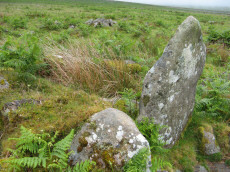 Within the outer ring of stones is a second ring of boulders not shown on Worth's plan but which may represent an inner kerb. The cist is 1.8m by 0.9m and 0.5m deep with an adjacent coverstone." Lethbridge p.52-3 Willingswalls Cist 2 (E of Reave) - diagram p52, photo p.53. Notes: "A group of four concentric stone circles of which the innermost one is considered to be a cairn circle. Three stones were standing in 1921 when all the fallen stones were raised during restoration. 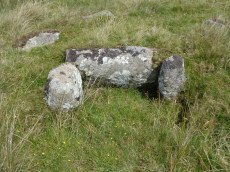 There also appears to have been a stone row leading away from the stone circles." and "The double row as planned by Worth except that one stone is now missing. It is 6.9m long with mostly small line slabs, set on edge. They are about 0.3m long and 0.3m high, the intervals between stones and between the rows being 0.8m". Notes: Turner F21. Cairn around 50 meters north-east of the Yellowmead stone circles, consisting of an earth and stone mound approximately 4 meters in diameter and up to 0.3 meters high. Four stones of a retaining kerb on its west and south sides. Notes: Turner G30 - Multiple Stone Circle. "A group of four concentric stone circles of which the innermost one is considered to be a cairn circle. Three stones were standing in 1921 when all the fallen stones were raised during restoration. 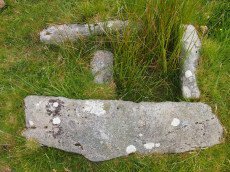 There also appears to have been a stone row leading away from the stone circles." 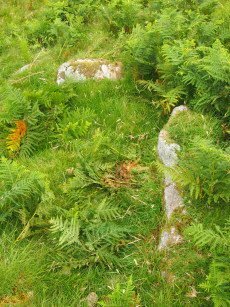 See also, Legendary Dartmoor: Yellowmead Stone Circle.